Prefers well-drained loamy or sandy soil. Sheltered spot in full sun or partial shade. Can be grown as a hedge. Crimson Clover. Corridors within the orchard that are planted with clovers and other legumes contribute to soil fertility and attract pollinators. Self-fertile but pollination is improved by growing in groups with two or more cultivars present. Begins to bear after five years. Healthy hazel trees will bear twenty years or more. 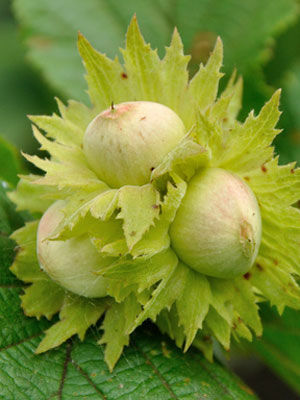 Hazelnuts grow best in climate such as the Pacific Northwest, where winters are chilly yet mild. Harvest when the husks begin to turn yellow in early fall. The nuts are much-loved by squirrels, birds and rodents.